The Amarillo Sod Poodles, Double-A affiliate of the San Diego Padres, unveiled their new identity program Tuesday at a press conference. "This has been an amazing journey that we have taken with the community here in Amarillo," said Tony Ensor, Sod Poodles President and General Manager. "Our goal from the beginning was to create an iconic identity that appeals to kids and families and is unlike any other in the country. The Sod Poodle proudly symbolizes a brand that cannot be ignored and is Authentically Amarillo!" The team name was selected after fans suggested more than 3,000 different names in a month-long name-the-team contest. 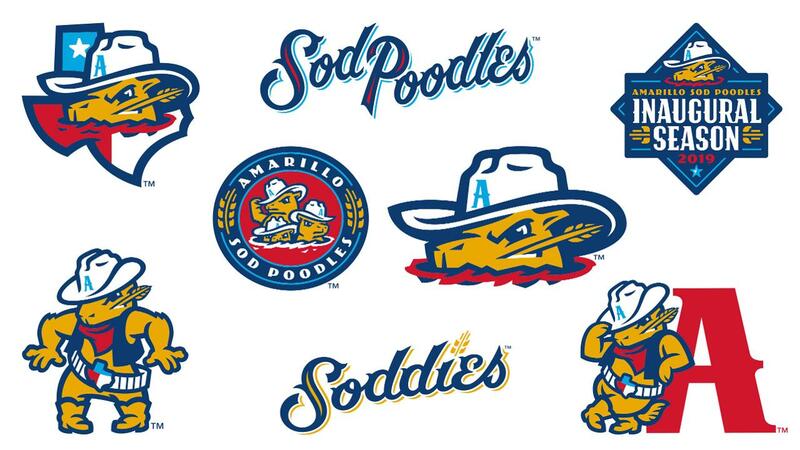 The Sod Poodles, a pioneer's nickname for the "Prairie Dogs", was chosen due to its Texas pioneer ties, appeal to kids, marketability, and representing the fun of Minor League Baseball. The primary logo features a coterie of Texas Sod Poodles defending their hometown turf. The cap logo features a Sod Poodle in the white hero's hat biting down on a stalk of prairie grass, a nod to the community's agricultural heritage. The leaning Sod Poodle is tipping his cap, representing Amarillo's welcoming hospitality. The quick-draw Sod Poodle represents the community's tenacity and tough of mind spirit. Finally, the Texas Pride mark represents the Sod Poodles' home, the great state of Texas. The Sod Poodles look was brought to life at Brandiose in San Diego, where they make teams famous by celebrating their brand stories. Partners Jason and Casey invented the first glow-in-the-dark on-field cap for the Casper Ghosts and first on-field rally cap for the Altoona Curve. They dreamed up top-selling logos for the El Paso Chihuahuas, Rocket City Trash Pandas and America's oldest baseball club, the Cincinnati Reds. "Jason and Casey have been incredible partners to work with throughout this process," added Ensor. "Together, we developed a vision of what we wanted to see and knew we had something special when they brought that vision to life." The development process began in April when Jason and Casey along with team staff met in Amarillo with fans and community members to learn about the stories, history, and personality of Amarillo. Brandiose developed the logos, uniforms and mascot, and is dreaming up many parts of the 2019 fan experience. "Amarillo citizens describe themselves a welcoming, genuine, and tough of mind community with a pioneer spirit," said Brandiose's Jason Klein. "They are self-sufficient, independent and family-oriented. We couldn't think of a better local animal that represents these values than a prairie dog." Merchandise featuring the Sod Poodles new look is available now at their temporary store located inside the Downtown Embassy Suites (550 S. Buchanan - left-side lobby area) and online at www.sodpoodles.com. The team's inaugural home opener is set to take place on Monday, April 8, 2019, against the Midland RockHounds, Double-A affiliate of the Oakland Athletics. Season seats, group hospitality, and corporate partnership options are now available for the inaugural 2019 season. Individual ticket sales, game times and promotions will be announced at a later date. For more information call 806-803-7762 or visit SodPoodles.com.